First, a group of tulips I have no memory of planting. I doubt if I would have picked this variety. The petals are white with pink edges. They look as though most of the colour has been bleached or faded away. Did they come from self-planted seeds? Tulips do produce seeds, but I don’t think I ever let mine do that. Or maybe stray bulblets? But in that case, where are the originals? Anyway, there they are, and quite picturesque too. I’m certainly not going to remove them. More about these tulips at the end of the post! These bergenias grow really close to the trunks of those two big Norway maples I complain about all the time. For some reason, they’re blooming really well this year. Epimedium x perralchicum “Frohnleiten” is one of the most dependable plants in the garden. I cut the old foliage down a few weeks ago, and now it’s in full bloom with fresh, bronze-tinted foliage emerging. The leaves will expand and grow green and leathery as the season progresses. Hellebore flowers in the subfusc stage. Finally, another look at one of the surprise tulip flowers. Close up this time. The really strange thing about these tulips is how they look just one day later. Same tulips, different colour. From white with pink edges to dark pink with white stripes! Even after decades of gardening, plants can still surprise me. These plants aren’t your run-of-the-mill hellebores, like most of the ones I already have. They are hybrids specially developed by breeders looking for striking effects and unique colours. First, Helleborus x ericsmithii “Pirouette”, a lovely soft pink with lime green nectaries and cream-coloured stamens that look like stars. Next, Helleborus x hybridus “Winter Jewel Black Diamond”. This is about as close as you can get to a black flower. It’s really a dark purple-red with a greyish bloom on the petals that gives them that nearly black look. “Black Diamond.” You can see the underlying red in the petals on the right. “Black Diamond.” The reverse sides of the flowers look almost blue! Finally, Helleborus x hybridus “Winter Jewel Ruby Wine”. This one looks gorgeous with the flowers and leaves backlit by sunlight. “Ruby Wine” living up to its name. “Ruby Wine” flower up close. The featured image at the top of the post shows “Ruby Wine” with “Ivory Prince” in the background. “Ivory Prince” has lived in a big blue pot near my front door for years. Now it has “Ruby Wine” for company. While I was taking pictures of the new plants, I noticed this youngish plant of the Corsican hellebore, Helleborus argutifolius, self-seeded in just the right place. Corsican hellebore’s lime green flowers. Lastly, not a hellebore at all, but a photo of the Japanese quince, Chaenomeles japonica, that grows against a weathered cedar fence at the back of the garden. Years ago, I saw a photo similar to this in a calendar and determined to reproduce the effect in my own garden. Unlike many horticultural intentions, this one has actually succeeded. Japanese quince flowers with weathered fence behind. Unlike the other plants in this series, this one doesn’t have a reputation for weediness. And yet, in my garden it seeds around freely, to the point I’ve pulled out seedlings that are too numerous or in the wrong places. So technically, hellebores can be weeds. It’s all a matter of being in the right place, after all. 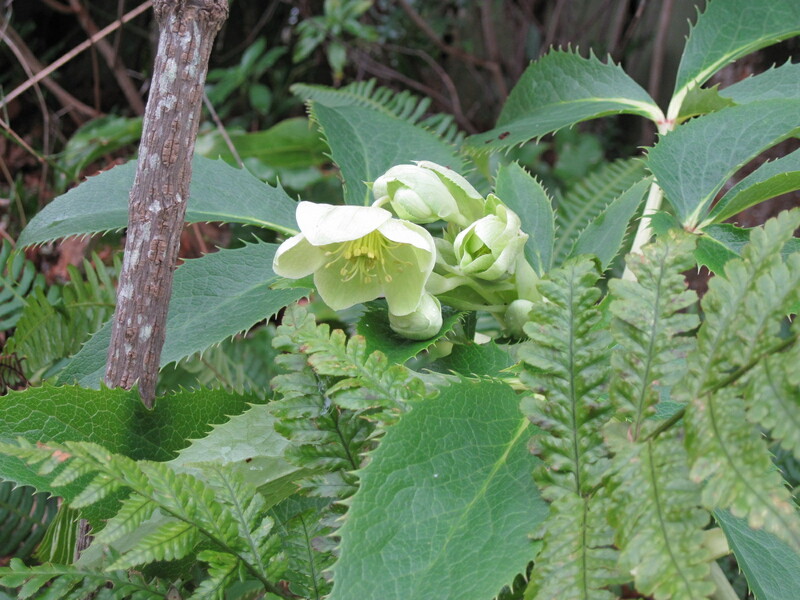 I have two species of hellebores here: the tall, jagged-edged-leaved Corsican hellebore (Helleborus argutifolius), with lime green flowers in winter and early spring; and the oriental hellebore (Helleborus orientalis), with flowers in shades from white to dark purple and big, round-edged leaves. Both put up with shade and tree roots, and are of no interest to deer. The plants are evergreen. They don’t vanish in autumn; in fact, that’s when they perk up and start to think about blooming. Buds appear by Christmas and flowers are present until mid-spring. 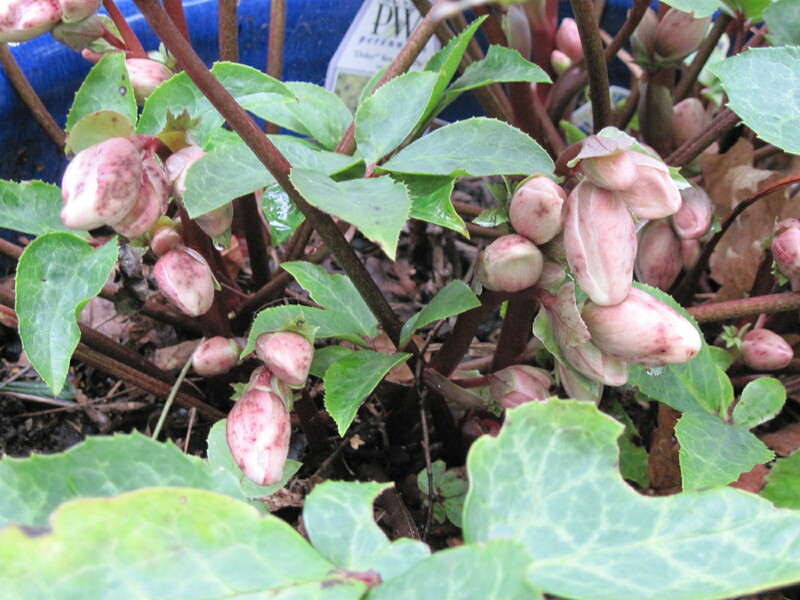 At that point, seeds are ripening, there’s lots of other stuff coming on, and it’s time for the hellebore bloom stalks to be cut down and removed. The leathery, dark green leaves look fine through the summer. A decent watering every week or two is helpful in our dry summers. If too dry, oriental hellebores flop and look pathetic, splayed out on the ground like they’ve given up. The plants are long-lived and reliable. Maintaining them is simple. Corsican hellebores bear their flowers and leaves on the same stems. By the time the flowers look tired and seedy (May in my garden), fresh stems have appeared. I cut down the old stems at ground level and that’s that. 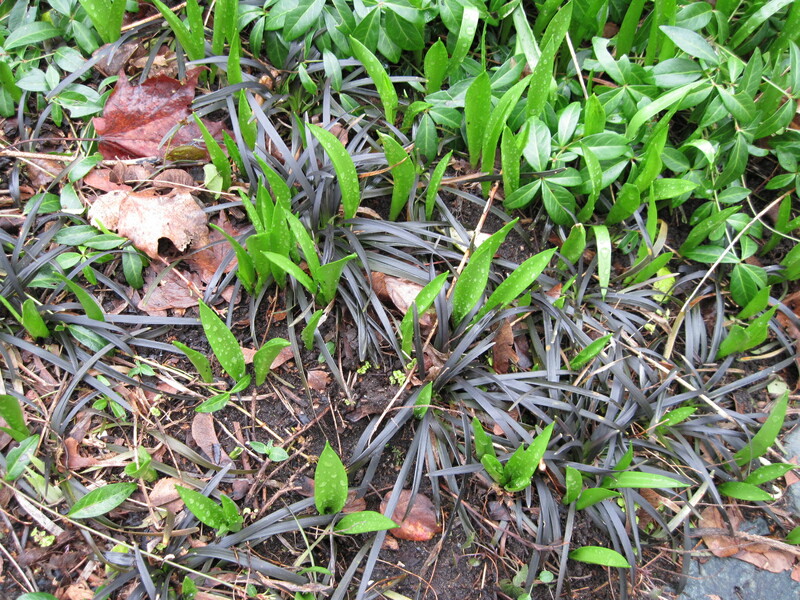 The plants do have a tendency to splay as the stems lengthen. In spots where I don’t want them to flop onto other plants, I pound in 3 or 4 stout stakes around a plant and surround it with twine. I untie this before the cutting down operation and replace it afterward, to support the developing new stems. Oriental hellebores produce separate leaf and flowering stems. I cut down the old leaves in spring, just about the time buds appear. New leaf stems grow along with the flower ones, so the plant rapidly plumps up again. I cut down the old flower stems by June to prevent seeding. When cutting down the old flower stems, make sure you don’t cut leaf stems by mistake (says the Voice of Experience). Hellebores do have one annoying pest — aphids. They love the new growth and can multiply alarmingly on fresh leaves and even on flowers. I wash them off with water, either from a spray bottle or with the hose. Over the years, I’ve seen one or two plants afflicted by what I suspect is some sort of fungal disease; they produce fewer flowers and stunted leaves. The best “cure” might be to remove the sick plant and replace it with a fresh one, keeping in mind that if the problem really does originate with a soil-dwelling fungus, the new plant may be affected too. Almost all of my hellebores are the basic species. I acquired my oriental hellebores by scooping up a clump of seedlings at the two-leaf stage with a teaspoon from a public planting. (I admit the deed!) That’s why they’re all in shades of pinky-purple, although the colours vary a bit within the group. I’ve also bought a couple plants, one white with pink speckles and a creamy yellow one (whose flowers almost always turn rusty brown at the edges, so it’s a disappointment). I also bought a plant of the variety called “Ivory Prince.” It lives in a big blue pot and is quite a feature in February. Plant breeders have been busy with the hellebore family, so a huge variety of colours and flower types is available. I’m intrigued by the ones with slate-coloured or almost black flowers, but the frilly double forms in shades of pink look like too much of a good thing to me. Hellebores, especially the Corsican type, are good “anchor” plants in a perennial bed. They have enough presence to impart elegance to spots that include some of the weedier tough plants. Hostas are good company for hellebores. Their leaves are similar in size but different in texture, and they like the same conditions. 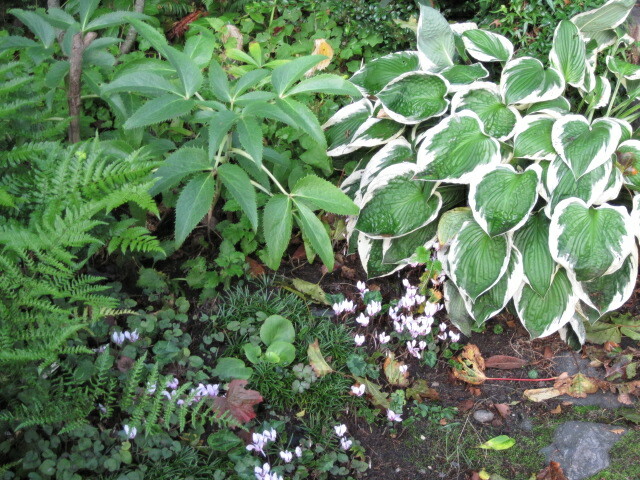 (In my rooty patch, however, hostas do best in pots parked near the hellebores, rather than planted in the ground). Ferns look good near hellebores too, specifically the tough Dryopteris types. In small gardens, Corsican hellebores may be used like small shrubs, underplanted with bulbs and a groundcover such as plumbago (Ceratostigma plumbaginoides), which has electric-blue flowers in late summer. I prefer it to periwinkle, which is evergreen and overly vigorous. I suspect most naive gardeners (even those with years of experience) think that a perennial bed or border, once made, is a done deal. Plants may come and go, but taking the whole thing apart and reconstituting it is unthinkable — sort of like rebuilding a house. 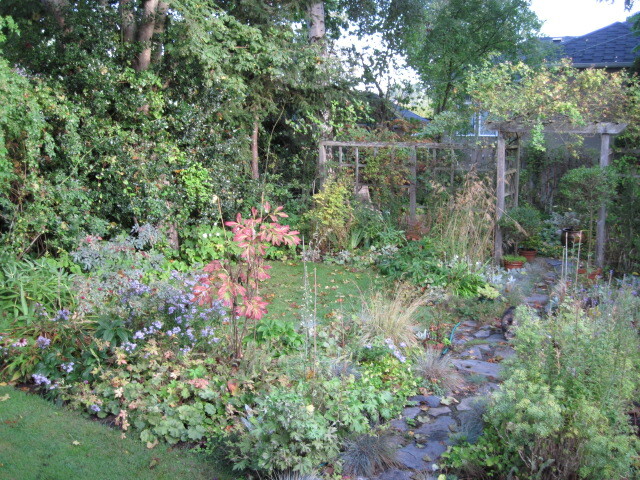 But of course a perennial border is a collection of living things, so it’s bound to change. Over time, the tough and hardy plants muscle out the weak and fussy. 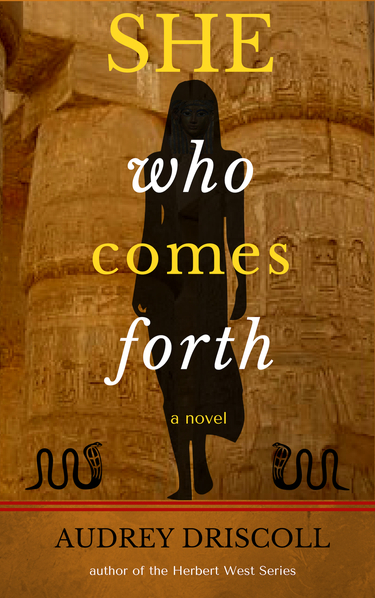 Some inevitably become dominant in the picture, while others disappear. The same scene, obviously, but details are different. Some plants have grown bigger or more numerous, while others have declined or disappeared. Superficially, though, one could say it still looks fine, despite the addition of dog-excluding fences in the 2015 scene. But I know it was lusher, fuller and better-maintained five years ago. I plan to retire from my job next spring. 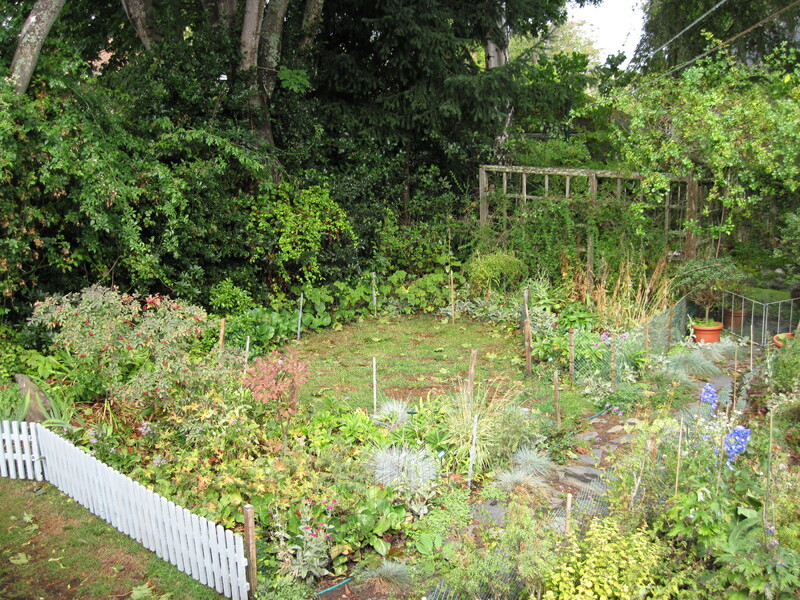 Near the top of my list of post-retirement projects is an overhaul of the garden, yanking it out of its present state of decline. Over the years I have whined about the effect of tree roots on perennial beds and vegetable patch (now the Ex-Veg Patch). I have vacillated between accepting the inevitable (substandard beds and borders in dry, rooty shade) or doing the heroic (and expensive) — tree removal. Now I wonder if there is a third option — rebuilding the border. I remember reading a description of how English perennial borders (the ne plus ultra of this form of gardening) were taken apart, re-dug, enriched and replanted every few years. This was (still is?) a routine procedure, intended to keep the border at a peak of perfection. Something like that — which I admit sounds pretty heroic, if less expensive — may be the answer, especially as I’ll have more time but less cash. So, a plan is needed. What plants to dig up and return to refreshed, de-rooted soil. What plants to dig up and discard. What plants to leave in place because they are too difficult to dig up. And I have to decide just when all this digging is to take place. The usual seasons for planting and dividing perennials are spring and fall. A rough rule is to divide spring bloomers in fall, and summer and fall bloomers in spring. But I think this operation is best done in spring, or even earlier — mid-February to mid-March, which I think of as “pre-spring” here on the fortunate west coast. With some care I’ll be able to extract the plants to be kept with enough soil around the roots that they won’t even know what’s happened. As for the final configuration of the beds, I’m considering fewer large and medium plants and more low groundcovers, such as variegated periwinkles, which are not as pushy and vigorous as the plain types. I’d like more hostas, but I’ve come to realize they really don’t do well in rooty soil. The only way I can grow them well is in pots. Therefore, a combination of large ferns (Dryopteris species) snuggled up to potted hostas (the ferns concealing the pots), with some white foxgloves in the background, and the stalwart hellebores, of course… Too many large plants already? Well, I’ll work it out. The best gardens, of course, are those in the gardener’s imagination. In the meantime, it’s reassuring that this small area near the pond, right now, looks a lot like this picture, also taken in 2010. I’ve gotten totally out of touch with my garden since the last bout of leaf-raking back in November. With the short days and winter laziness, I’ve spent almost no time actually working in it. Mostly it’s been “hello, goodbye” glimpses as I race off to work in pre-dawn darkness and come back in the early dusk. I haven’t written a garden-related blog post for a while either, being engrossed in reading, writing, writing about writing, critiquing, tinkering with prose and making amateurish but sincere book trailers. The garden goes on regardless. That’s one of the wonderful and scary things about gardens — they have their own lives, in which gardeners may participate or not. The extent and type of participation shapes the garden, of course, but even when the gardener is absent all kinds of things are going on. Today I took a walk around my garden and found some of them. 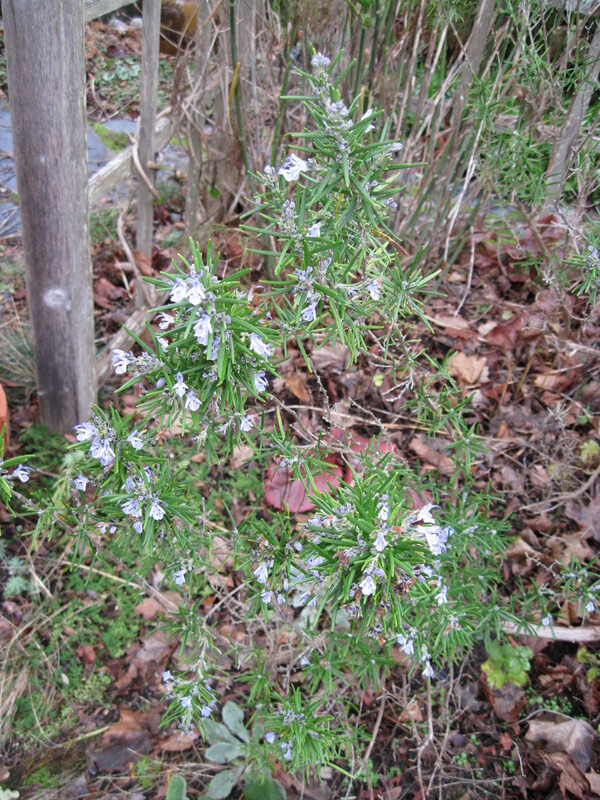 Rosemary is blooming, a surprise because it’s such an old, gawky plant in a less-than-ideal spot under an apple tree. The Corsican hellebores — increasingly indispensable in this garden — are starting to bloom, and the oriental hellebores, such as “Ivory Prince” (shown below), are thinking about it. 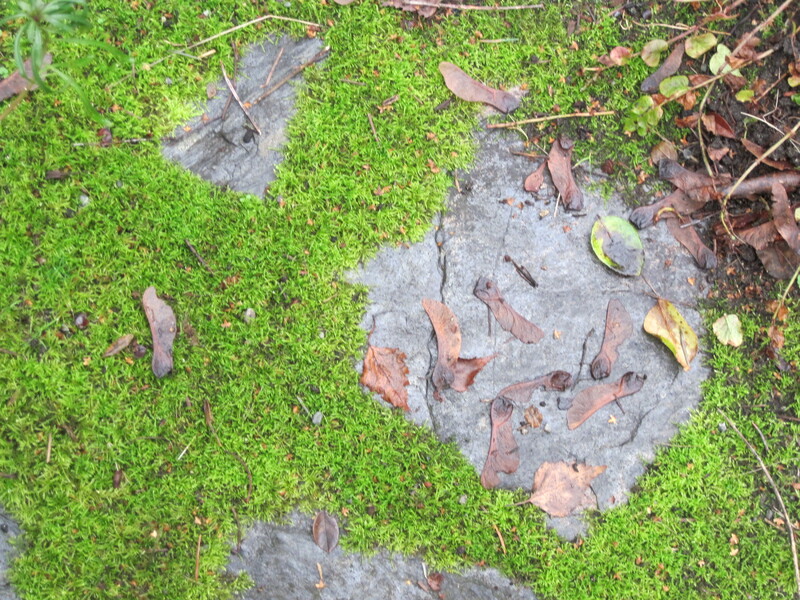 Mosses are at their best now, with no lack of moisture. 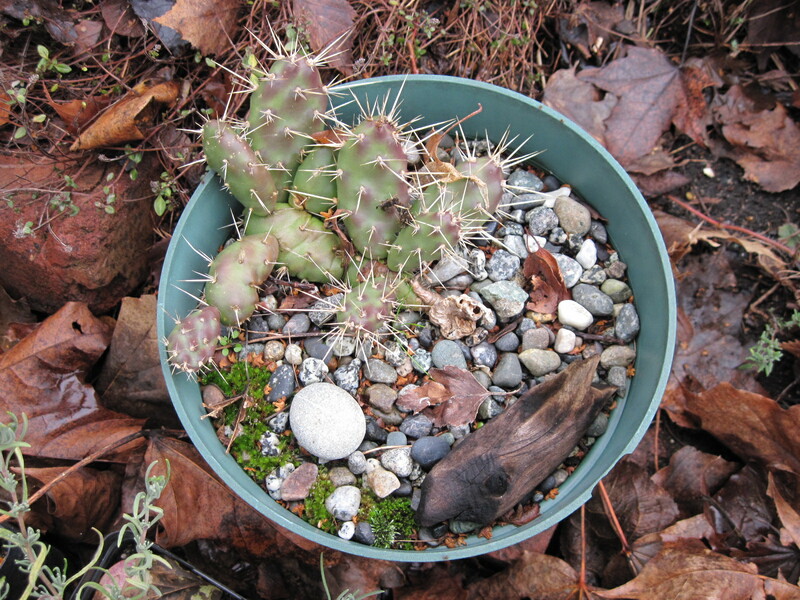 And through all weathers, this little Opuntia cactus, originally from Ballenas Island in the Strait of Georgia, just sits there, intensely prickly (rather like the gardener on a bad day). Maybe it will manage to bloom someday. This year, instead of a separate page for garden photos, I’ve decided to do a monthly “state of the garden” post, complete with pictures. This, of course, is the one for January.